This morning I walked from Egton Bridge to Grosmont to meet Sarah and Simon. The three of us walked together for a few hours and then Simon decided to rush ahead and meet his walking buddy from the previous year in Robin Hood’s Bay. Sarah and I continued on together. We have very similar paces and we transition from silence to chatting on and off. She’s pretty funny! It’s hard to believe it’s the last day of the walk. 13 walking days and 192+ miles. Both Sarah and I were feeling a bit sad that it was our last day. It has become such a nice routine. Wake up, pack up, eat breakfast, prepare my feet, pick up lunch and start walking. Stop for lunch and walk some more. Stop for a snack or a toilet break and walk some more. Take in the beautiful scenery, breathe the fresh air and walk some more. Arrive at our destination, remove my boots and socks, don my flip flops, shower, change and eat dinner. Read about the next days walk, make sure I had all the maps I needed on my phone, charge up my electronics and go to bed. Wake up and repeat. Seeing the ocean again, although this time the North Sea, was a bit strange. Beautiful, yet sad. Sarah and I were wondering why Wainwright didn’t end the walk in the beautiful coastal town of Whitby. 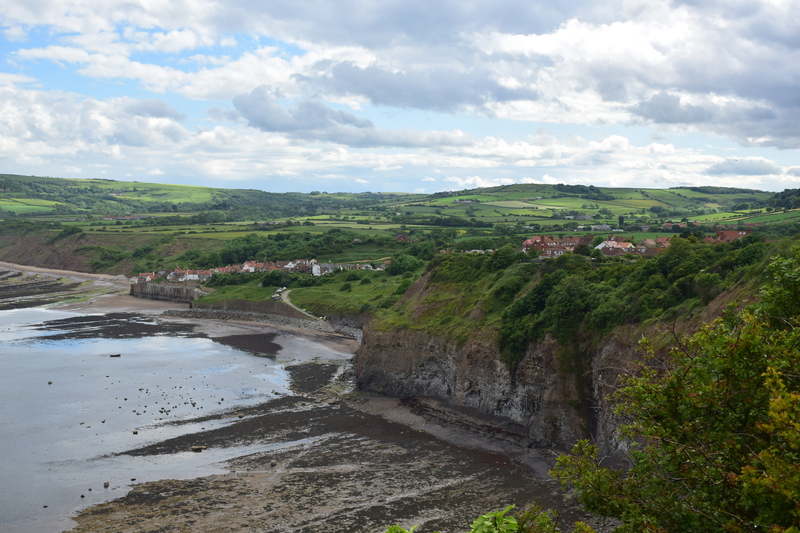 I think we got our answer once we were able to see Robin Hood’s Bay. It looks very much like the coastal town of St Bees, the beginning of the walk. From one side to the other. This concludes my adventure. 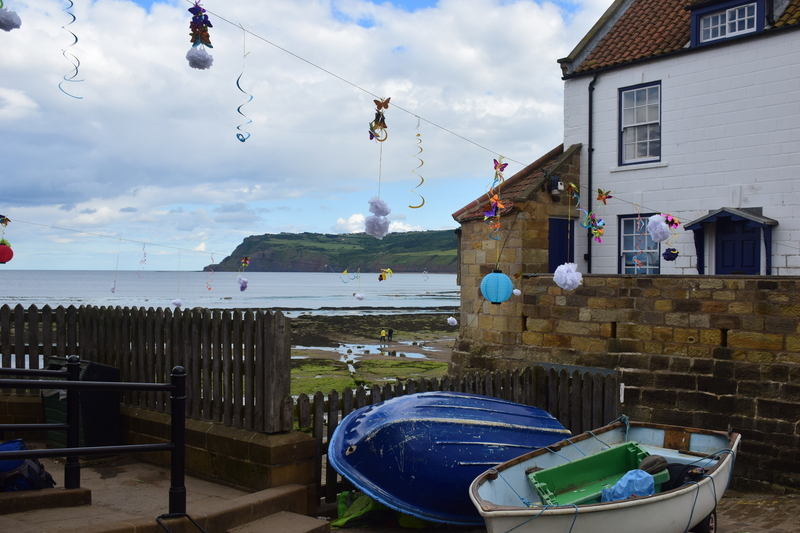 We arrived in Robin Hood’s Bay and found Simon for a drink at Wainwright’s Bar by the water. We signed into the Coast to Coast book, drank beer or in my case a cider, relaxed and looked out at the sea. I’m glad I got to meet Simon and Sarah, they were good walking companions. Two very kind people. We had dinner at the Victoria Hotel back up the hill, closer to our B&B’s. We invited another solo Coast to Coaster to join us for dinner. His name was Simon as well. We ate a wonderful meal and chatted for hours. My eye lids were getting very heavy and so the day ended. What a great journey! just saw this, two years later! 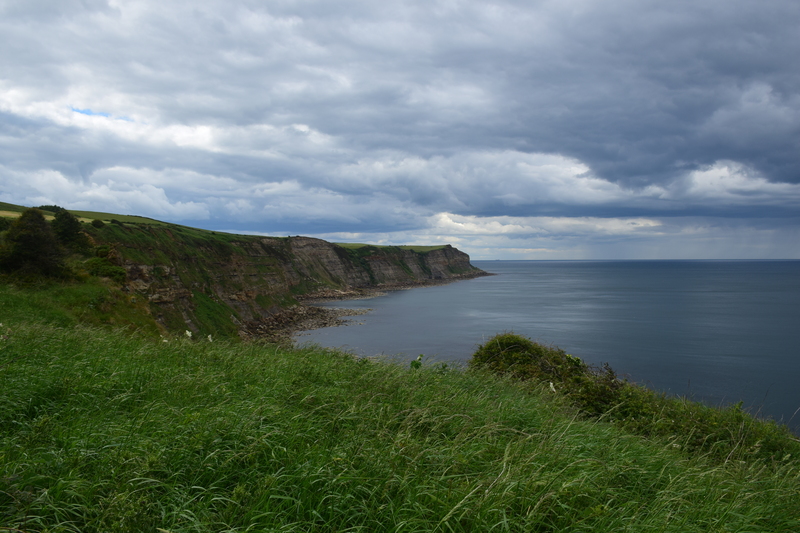 Hey I was there a few years ago – stayed at Boggle Hole – asked in RH’s Bay how to get to it, they said just follow the coast line. So I trekked down the beach. Found it – right at the time a sewer truck was dumping his entire load into the bay – it was horrid! Besides that, magical !